I've always had a particular affinity for Epson projectors, and by Vegas standards I may be tipping my hand at the outset of this review. Their ongoing evolution continues to produce video projectors that--novices take note--are straightforward to set up and easy to use, yet offer so-inclined enthusiasts under-the-hood color science with a logical menu structure. In other words: highly accurate calibration results that can get you to the Nth degree of video performance at a very fair price. The recently introduced 3LCD design Epson Home Cinema 4010 marches forward with these traits intact, while the 4K PRO-UHD moniker points to improved 1080p pixel-shifting Epson suggests performs perceptibly on par with native 4K projectors (more on that in a moment). A reworked algorithm for HDR10 tone-mapping with up to 10-bit color depth accompanies 2,400 lumens (700 nits) specified light output from the 250-watt UHE lamp, with a lifespan from 3,500 to 5,000 hours (dependent upon settings). Rated contrast of 200,000:1, with 3LCD's equal white and color brightness, lights up screens via a dynamic iris coupled with a 15-element, all-glass lens for uniform edge-to-edge brightness. Ten lens-memory locations store aspect ratio presets, including constant height when paired to a Scope (2.39:1) screen, eliminating the need for a secondary lens. In Digital Cinema mode, ideal for UHD Blu-ray, Epson claims 100 percent reproduction of the extended DCI-P3 wider color gamut. Including 3D capability, the Home Cinema 4010 hosts a feature package that belies the $1,999.99 asking price. Despite vastly improved pixel-shifting refinement, it's fair to pose the question whether native 1080p in an ever-increasing native 4K projector landscape implies dated technology. Let's find out. For years, as the race to UHD 4K video unfolded in the consumer front projection marketplace, Sony enjoyed pole position, with no other qualifiers for quite a while. Competing manufacturers have slowly introduced 4K technology while some still employ signal processing algorithms utilizing pixel-shifting, an attempt at creating the impression of a 4K fill factor from 1920 x 1080 HD imaging panels. Said more simply, pixels are asked to do double duty with the signal in a "hand is quicker than the eye" manner to seemingly portray more of them on the screen than possible by inherent design. Early implementation of this technique left much to be desired, as image detail softened due to the pixels shifting. In almost every instance, improvement was rendered by defeating this feature on earlier projectors that offered it. But pixels, shifted or not, are not the whole story. At CEDIA Expo 2018, Epson strove to demonstrate the proposition that resolution, while keenly important, is less the key element to image clarity and overall fidelity in a 4K universe than three other major picture components: dynamic range, color saturation, and color accuracy. Attending their CEDIA demo, I sensed Epson's posture as being that UHD does not propel a product past HD designs based singularly upon resolution, though perception in the marketplace perhaps leads projector shoppers to draw such conclusions. So... is there something to this conjecture? Can Epson's latest wizardry woo the naysayers? Let the testing begin. 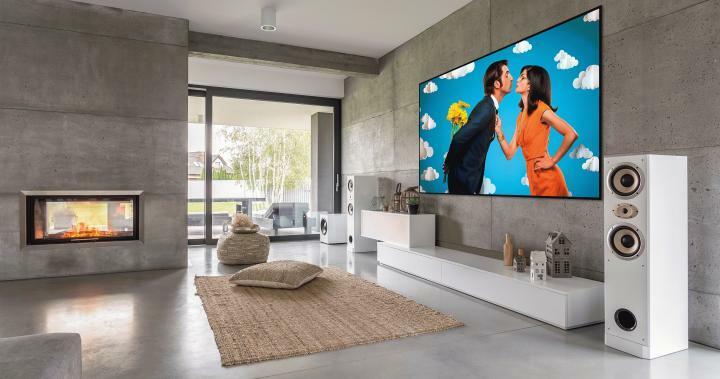 Epson recommends screen sizes from a tiny 50 inches to a highly ambitious 300 inches for the Home Cinema 4010, with 1.35 to 2.84 as the stated throw ratio range. I positioned the Home Cinema 4010 atop a tall-ish audio cabinet against the back wall in my studio, ideally positioning the lens 21 feet from, and at the vertical center of, my 123-inch diagonal Stewart FireHawk G3 screen. As a result of previous experience with Epson projectors, I had the Home Cinema 4010 out of the box and delivering a perfectly sized, active image in a mere ten minutes. The 2.1X motorized lens is accompanied by ample lens shift, up to +/- 96 percent vertical and up to +/-47 percent horizontal. Delicate, jump-free feathering of image sizing and, more importantly, focus adjustment was quick and precise, governed by a three-axis precision motor that also adeptly maintains screen memory locations with repeatable accuracy. All functions are easily called up from the Home Cinema 4010's comfortable, backlit, full-sized remote control. While the Cinema 4010 is equipped with keystone correction, any need for keystone adjustment indicates that physical placement of the projector is somehow amiss. Digital keystone correction alters proper pixel mapping to the imaging panels, producing artifacts affecting picture fidelity. This is a nice feature to know that you have, but it's not one you should use if it can be avoided. Take the time and energy to get your projector installed/positioned correctly so you don't need to use keystone adjustments. It is just a good practice for all video enthusiasts. The chassis-centered (meaning not offset) lens on the Home Cinema 4010 enables even the timidest DIYer to align the lens with the screen center, ideally close as possible to the top (or bottom) of the reflective material. Making certain the projector is horizontally level front/back and left/right ensures a professional result. With footprint dimensions of 20.5 inches wide, 6.7 inches high, and 17.7 inches deep, the Home Cinema 4010's stature combined with 24.7 pounds of heft conveys solid construction, while a two-year warranty backs up anticipated product durability. The 3LCD imaging technology employed by the Home Cinema 4010 incorporates individual red, green, and blue liquid crystal panels that compose the image while producing the projector's range of colors. At 100 operational hours of casual viewing prior to calibration and critical evaluation, a check of panel convergence found it to be perfect at every point on the screen. With R/G/B selected for comparison, the internal crosshatch pattern was perfectly free from any hint of color fringing, especially around the challenging extreme perimeter. This is testament to the superior lens, Epson assembly line precision, and careful parts selection during the design process. Color fringing when display such patterns is often mistaken as convergence error, overlooking the possibility of chromatic aberration introduced by poor lens quality. Epson's lens choice for the Home Cinema 4010 might have easily surpassed the price of the entire projector only a few short years ago. Rear terminal inputs consist of two USB Type A (one designed to provide power to optical HDMI cables and one for wireless and firmware); one mini USB (service only); one LAN port (RJ-45); one Computer/D-sub 15 pin; one RS-232c (D-sub 9-pin); and one Trigger out (3.5 mm mini-jack)12 V DC, 200 mA maximum. There are two HDMI 1.4 inputs, one with HDCP 2.2 to manage UHD content, with a maximum bandwidth of 10.2 Gbps. With the popularity of streaming services, inability to handle 4K/60Hz HDR and lack of an 18 Gbps chip set hampers the Home Cinema 4010 from inclusively being fully-future forward, though such signals would be viewable in SDR. Where this may loom as a larger demerit is for ATSC 3.0 sports broadcasts and their promise of smoother, more fluid motion at 4K/60Hz. And as 4K/60Hz HDR games become commonplace, such considerations should be factored in for multi-use employment.